World War II was fought on such an epic scale that it is hard to imagine a museum being capable of reflecting its magnitude. When we discovered that The National World War II Museum was located in New Orleans, we knew a visit was required. Little did we realize just how engrossing the exhibits would be at this world class institution. Join us as we explore the amazing exhibits that show the cost of peace of the Second World War. We would like to thank The National World War II Museum for their hospitality. Rest assured that all opinions are our own. Being Kansas City natives, we have the World War I National Museum close by, so we have seen how this conflict was portrayed. (You can read about the WWI Museum here.) Our visit there, was a national war museum first for us. With such a broad range of subjects and battles from WWII to detail, we were curious how well any museum would be capable of handling the task. Arriving at the museum, our first impressions were that the site is massive. We noticed a crane nearby, and realized they were in the process of adding even more square footage to their footprint. Stepping into the lobby, we found an assortment of war machines that would be the highlight of many other museums. At the National World War II Museum, these were merely enticements to pique our interest in what was to come. 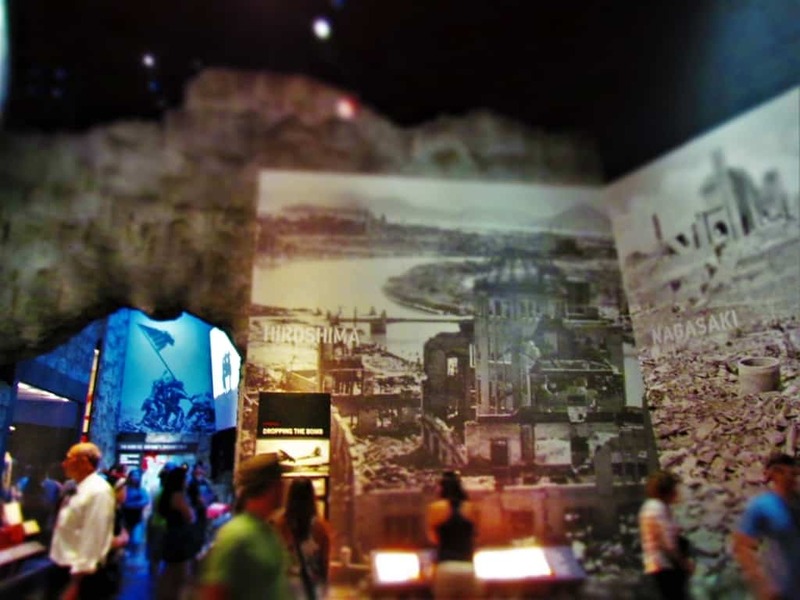 The National World War II Museum follows a chronological path for the most part. There are special “rotating” galleries that hold temporary exhibits. During our visit, we wandered through one that highlighted Bob Hope’s USO visits to service people throughout the various war zones. While it was quite engaging, our main purpose was to scope out the permanent displays. We headed off to the first gallery, which highlights the atmosphere of the world in the period leading up to the start of World War II. 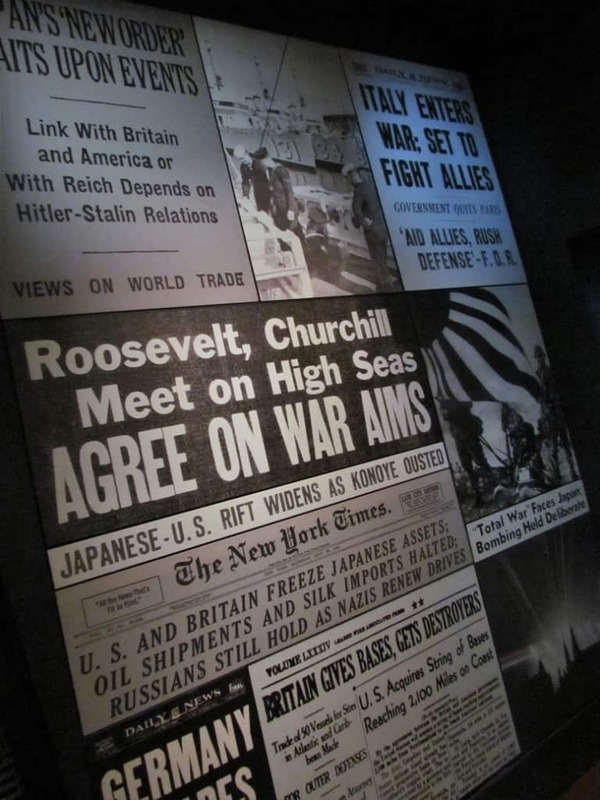 Newspapers around the world began a steady stream of headlines focused on events leading up to war. Citizens of most countries were eager to read news on what was occurring in the world. An unending march of aggression and preparation added to the nervous atmosphere. It was clear that the world was once again marching to war. By 1941, war had been raging in Europe for over two years. Far separated from the turmoil, the United States had sat on the sidelines. Some support was being offered, but it mostly came in supplies and denouncing the actions of the aggressors. The U.S. sent support to Britain, who was embroiled with Germany, as well as China who battled Japan in the Eastern Theater. When Japan demanded that the U.S. discontinue aid to China, it was met with a demand that Japan evacuate all Chinese lands. Seeing an opportunity to destroy the U.S. Pacific Fleet, Japan attacked Pearl harbor on December 7, 1941. War had come to America. Since the fall of 1939, many U.S. citizens had wondered what would happen if the country went to war. The growing cost of peace had finally come to the point that the nation could no longer watch from afar. After the Japanese attack, people rushed to enlist in every branch of military service. Suddenly the manufacturing focus changed from household items to war materials. Many automobile factories converted into the manufacturing of airplanes and armored vehicles. During the war, the United States would turn out an average of 49,000 aircraft per year. With hundreds of thousands of citizens moving into service, the country felt the labor shortage. Many women stepped in to fill this void. It would not be long until other shortages would arise. Conservation and recycling programs pushed the need to save resources for the soldiers. Victory Gardens were started as a way to grow your own food. These government encouraged gardens would lead to half of the country’s produce being home grown. War bonds and war stamps became highly touted as a way to speed up economic recovery. The United States was still suffering from segregation. African Americans saw wages that were lower than those of whites, and they were often the last to be hired. Those that enlisted faced discrimination on all fronts. Over time, they faced these challenges and rose to the occasion. While not openly integrated into the white divisions, many African American units would also pay the cost of peace. The alignment of Allied forces versus Axis forces drew a line between nationalities. Many Americans would become suspicious of neighbors of German, Italian, and Japanese descent. Interment camps were created to detain over 110,000 Japanese Americans. On the other side of the world, Allied troops were heavily engaged with the German and Italian forces. In Africa, British and American troops battled to squelch the Nazi tide. A “briefing room” is designed to replicate an abandoned farmhouse. Hear we learned about the reasons behind the decision to tackle this region, before turning to the Asian Theater. 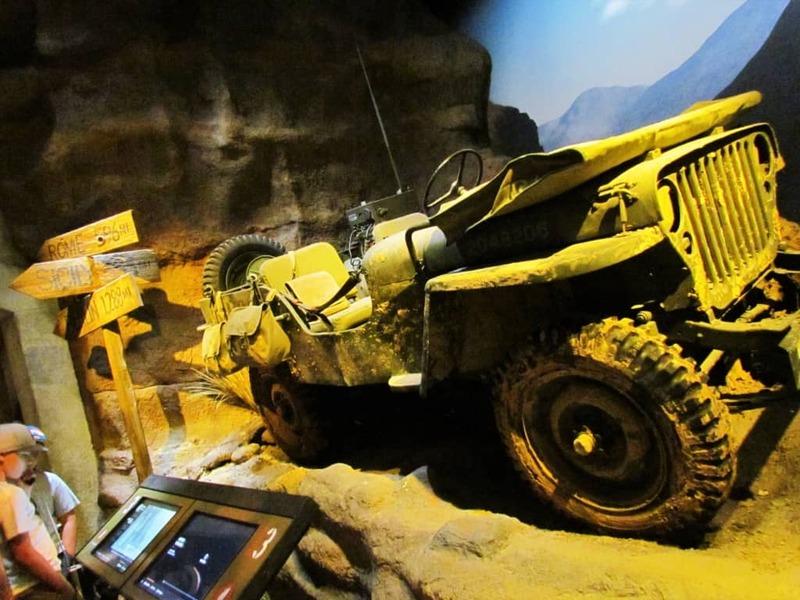 This 1943 Jeep is just one of the authentic artifacts that helps to paint the compelling story of the cost of peace. Many of the displays include interactive panels that guide the visitors through an examination of the events of the war. Here we were able to pick up so many new pieces of information that we missed in our school years. As we continued through the museum, we were led through the invasion of Italy. This months long campaign taught the Allied forces many important lessons that they would need for the assault against Germany. All along the landscape the Germans had built a series of reinforced bunkers. This defensive position was referred to as the Siegfried Line, and included barbed wire and mine fields. 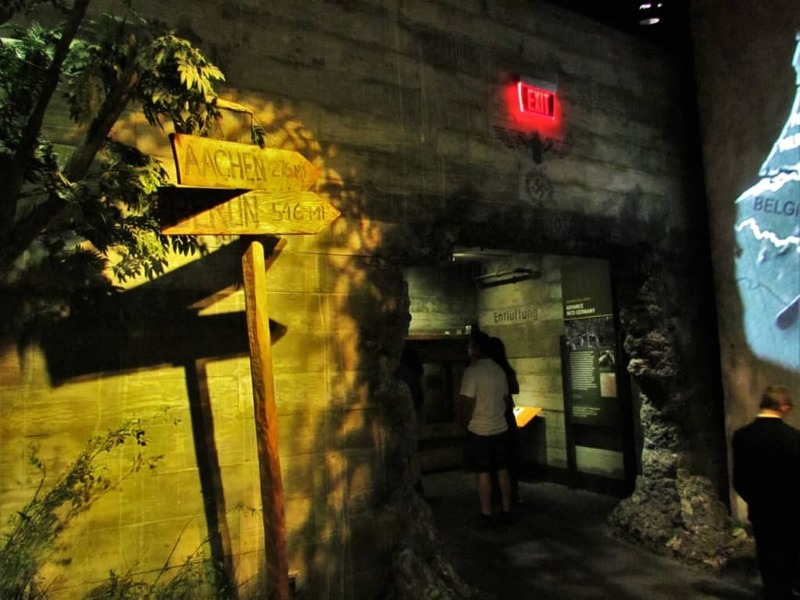 One gallery is a recreated bunker that has been taken by Allied forces. It is easy to see how formidable this defensive stance would have been to advancing troops, as they marched toward Berlin. One of the most notable engagements was the Battle of the Bulge. Immersing ourselves into the gallery dedicated to this six-week battle was another reminder of the hardships that troops faced as a cost of peace. This would be the last major offensive campaign by the German Army. Fighting in a densely wooded forest, it was a surprise attack designed to thwart the advance of Allied troops. The element of surprise favored the Germans at the offset of the battle, but circumstances would turn quickly. The Battle of the Bulge would become the bloodiest single battle fought by American troops in World War II. Through the years, most of us have learned quite a bit about World War II. 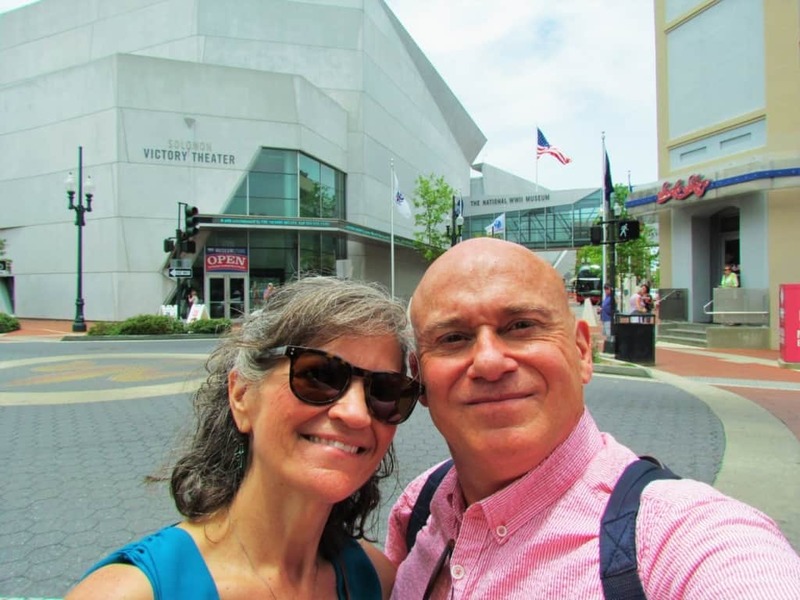 Our visit to the National World War II Museum was not just to educate ourselves on things we had missed, but to see how the messages were presented. What we found was an amazing collection of exhibits housed in spaces that transport visitors into the reality of the situation. Entering the space dedicated to the naval war, we found ourselves on the bridge of a ship at sea. As we made our way through the gallery, the environment continued to engage us with realistic displays. Each gallery we entered brought a sense of realism. The museum combines lights, sounds, and authentic artifacts to help show the cost of peace. 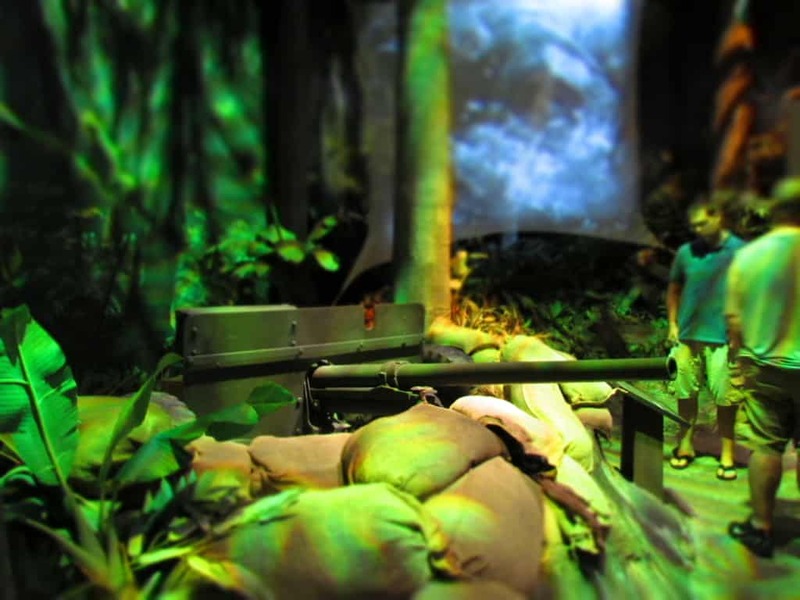 In the jungle zone, visitors trace the battles that led from island-to-island. The extreme conditions created unexpected difficulties for Allied troops. With no infrastructure the progress would be slow. Wave upon wave of Banzai charges were matched in deadliness by the diseases unfamiliar to Allied troops. Throughout the displays we learned the stories of those who carved a new infrastructure out of the jungles. There were also a host of doctors and nurses who worked feverishly to treat the diseased soldiers with newly developed vaccines. Listening to stories of the war being told by participants brings the war to life. As the scene changed from sea to land, we explored the landing on Guadalcanal. We could almost feel the humid heat of the jungle and feel the biting mosquitoes that harassed the troops. Facing the overwhelming obstacles that the Japanese Army had prepared for them, the troops fought on at a terrible cost. Japanese soldiers would forego surrender and fight to the death. The cost of peace continued to escalate as the end of the war came closer. Japan’s refusal to surrender led to unprecedented bombings. As these did not appear to bring an end nearer, a hard decision had to be made. Continue adding to the loss of Allied forces or deal an unimaginable blow to the enemy. Calculations were made that showed the potential loss of American lives, if the fire bombing was to drag out. A decision was made to drop atomic bombs on Hiroshima and Nagasaki. These devastating actions forced the Japanese leaders to finally surrender. This gallery paints a somber picture of the total destruction. Our time had run out, and we were forced to leave before truly studying all of the exhibits. One of the staff members pointed out that the construction equipment we had seen outside was in the process of starting an expansion of the National World War II Museum. With what we had missed, and the promise of even more new galleries, we know that a return visit will be required. Museums such as this are a stark reminder of the cost of peace that we humans face every day. As we find ourselves pitted in an ongoing struggle with nature, wouldn’t it be better for us to focus our efforts on fighting other global challenges. 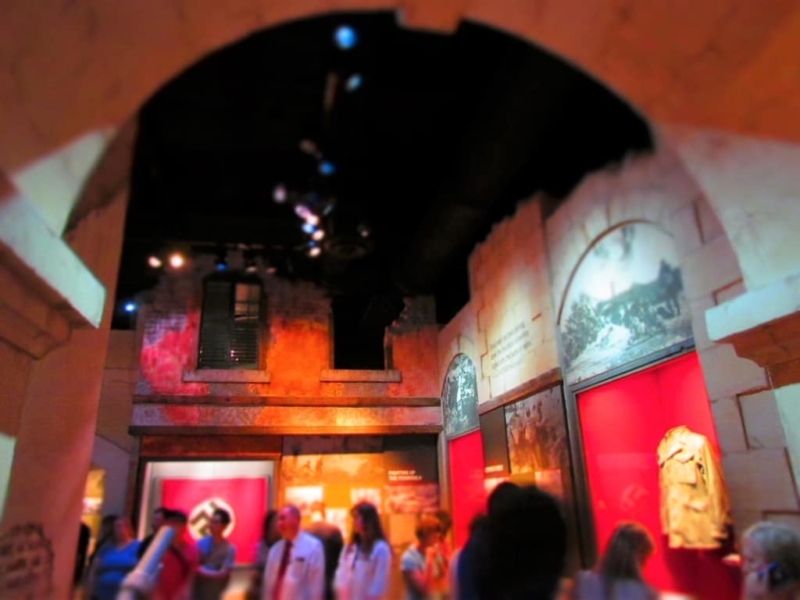 How many of you have visited the National World War II Museum in New Orleans? The National World War II Museum in New Orleans has been on my to-do list ever since it opened. I’ll get there eventually. Meanwhile, I enjoyed visiting with you. We certainly hope you have the opportunity to visit. It’s one of the best done museums we have toured. My dad served in World War II and I would love to visit this museum. Your vivid descriptions were the next best thing! Thanks for the compliment. Hope you have a chance to visit. After visiting the WWI National Memorial in Kansas City, I would love to visit this WWII one in New Orleans, of all places. It sounds like it would also be educational. My father fought in WWII. 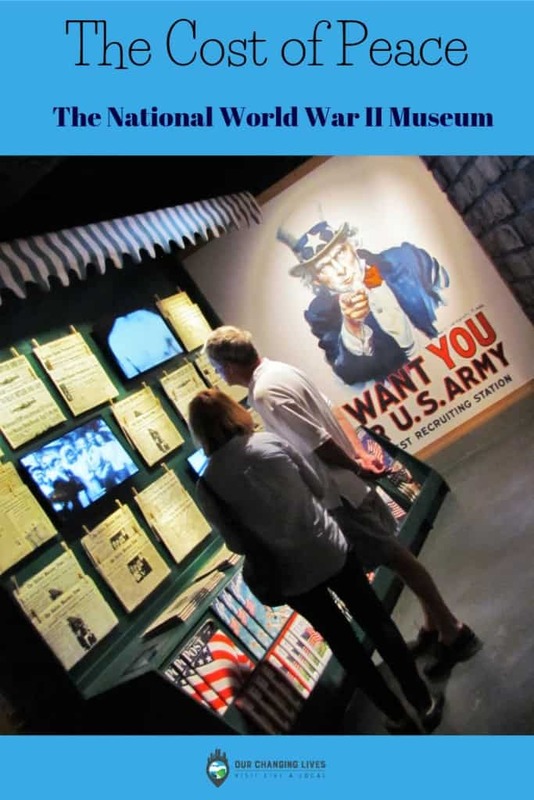 Our hometown WWI Museum is one of the main reasons we wanted to see the New Orleans sister site. It was so worth the trip. I think visiting war museums should be a must on every traveler’s itinerary and should be part of every politicians introduction to public service as well. . .perhaps we’d all finally learn from history and not be so quick to conflict. Sounds like a great place to visit in New Orleans. We agree wholeheartedly. We believe that the human race should be beyond wars by now.